Help save the Lives of Others. Earn Up to $400/mo. By becoming a plasma donor, you can earn money while helping save the lives of many people. We believe your time is valuable, so following your donation you will receive compensation payment for your efforts. Your plasma contains many antibodies and proteins that are used to provide life saving medications to others around the world. Your donation provides immunity from disease to others who have lost their immunity due to life threatening illnesses. Cancer patients, transplant patients, premature infants, pregnant women, and those with autoimmune disease as well as people born with other plasma protein deficiencies are just a few examples of the many uses for plasma based products. 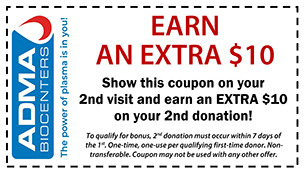 Bring this coupon on the first day and you will receive a $10 bonus after your second donation.